From Department of Psychiatry, University of California San Francisco, San Francisco, CA (JYT); Asian Health Services, Oakland (TQ, TBD, ESNP, SMH); Division of General Internal Medicine, University of California San Francisco, San Francisco (CW, TTN); Asian American Research Center on Health, San Francisco (JYT, TQ, CW, TTN). Introduction: This study examined the feasibility, acceptability, and efficacy of an interactive “Mobile Doctor” intervention (iMD) for Korean and Vietnamese American men, population groups with high smoking prevalence rates. Methods: The iMD delivers 5As (Ask, Advise, Assess, Assist, and Arrange) via tailored in-language video messages on a mobile tablet to Korean and Vietnamese male daily smokers right before a health care visit. A single-group trial was conducted with Korean- and Vietnamese-speaking patients at a federally qualified health center. Outcomes were assessed by self-reported surveys obtained postvisit and 3-month follow-up, and by examining electronic health record (EHR) progress notes from 3 consecutive primary care visits to evaluate impacts. Results: Among 47 male daily smokers (87% participation rate), 98% were limited English proficient and 53% had no intent to quit smoking within 6 months. On average, iMD took 12.9 minutes to complete. All participants reported discussing smoking with their providers during the visit, and more than 90% thought iMD was at least somewhat helpful in their decision about quitting and in communicating with their providers. EHR-documented 5As were significantly higher at the iMD visit for Assess (38.3%), Assist (59.6%), and Arrange (36.2%) compared with other visits without iMD. At 3 months, 51% made at least 1 24-hour quit attempt since the intervention. The self-reported 7-day point prevalence abstinence was 19%. Conclusions: iMD is feasible and acceptable to Korean and Vietnamese male smokers, including those who were not intending to quit smoking. It is a promising tool for increasing patient-provider discussion of tobacco use and possibly smoking cessation among Asian American male smokers. Asian Americans are the fastest growing racial ethnic group in the United States.1 Smoking prevalence remains high among Asian American men with limited English proficiency (LEP), including Vietnamese (43%),2 Korean (37%),3,4 and Chinese (29%) Americans.5 High social acceptability of smoking in the immigrants' countries of origin6 and in the United States,7,8 low quit intention9⇓–11, and low use of smoking cessation resources11⇓–13 among Asian Americans were the key challenges identified facing tobacco control in this population. Because the low rate of physician advice to quit smoking may be due to time constraints, strategies for streamlining patient-physician communication are greatly needed, particularly with LEP and immigrant populations. There are few such intervention studies for Asian American smokers in clinical settings. Our team developed an “interactive Mobile Doctor” (iMD) intervention, an in-language mobile application consisting of questions that a smoker can answer, followed by tailored video responses. This intervention was designed to facilitate the delivery of the 5As in primary care settings to promote patient-provider discussion about tobacco use. This study examined the feasibility and acceptability of iMD for Korean- and Vietnamese-speaking male patients in a primary care setting. This was a single-group feasibility trial with assessments conducted via telephone or in-person surveys from participants at baseline, postvisit (immediately or within 1 week after the clinic visit preceded by iMD intervention), and 3-month follow-up after the clinic visit. Participants were patients presenting for primary care provider (PCP) visits. Electronic health record (EHR) progress notes from participants were extracted to evaluate the impact of the intervention on the delivery of the 5As. The study was approved by the institutional review board of the Association of Asian Pacific Community Health Organizations and registered at ClinicalTrials.gov (identifier, NCT03064724). This study was a community-academic research collaboration between Asian Health Services (AHS) and the University of California, San Francisco (UCSF). AHS and UCSF collaboratively developed the iMD in Korean and Vietnamese languages that delivered 5As via tailored video messages on mobile tablets to Korean- and Vietnamese-speaking male smokers right before their PCP visits. The tailoring algorithm was guided by the principles of the 5As of the guidelines.14 The video contents and scripts were further informed by findings from focus groups with 17 Korean and Vietnamese smoking patients and 8 health care providers or clinic staff,18 along with smoking cessation education materials adapted from the team's prior study targeting LEP smokers.13 To increase relevance to the patients, AHS and UCSF medical providers were featured in the videos, delivering the health messages in Korean and Vietnamese languages. The video contents for the 2 ethnic groups were similar, with slight modifications to ensure cultural relevance (eg, culturally relevant proverbs, popular sayings, or images). The final version of the intervention videos integrated findings from a series of iterative pilot usability testing sessions with 3 Korean and 3 Vietnamese smoking patients and feedback from 5 AHS patient advisors (2 Korean and 3 Vietnamese). The iMD was run on an Android platform and delivered on a tablet. Patients were recruited from 3 primary care clinic sites at a federally qualified health center (FQHC) providing comprehensive health care to low-income, uninsured, and underinsured patients in Oakland, California. Participants included a convenience sample of Korean and Vietnamese men who were patients presenting for a PCP visit at a study clinic, were 18 to 75 years of age, spoke Korean or Vietnamese, and reported smoking at least 1 cigarette in the past 7 days. Reading literacy was not assessed nor required for participation. Before launching the study and recruiting participants, clinic staff and providers were informed about the study at a clinic-wide staff meeting. Some video clips of the iMD intervention were shown at the meeting. Providers were told that the intervention would be provided to approximately 50 Korean- and Vietnamese-speaking patients and the study implementation would aim not to interfere with the clinic workflow. The PCPs were asked to address the topic as they would in their usual practice. Research staff identified eligible patients with upcoming PCP appointments and contacted them, either by telephone before the day of the visit or in person at the visit, to provide a description of study involvement, confirm eligibility, and obtain informed consent. Enrollment took place from March 2014 to July 2015. Participants received $10 for completing a postvisit survey and $15 for completing a 3-month follow-up survey. No incentive was provided for completing a baseline assessment nor the intervention. At the intervention visit, just before engaging with the PCP and/or being measured for vital signs, research staff made the language selection on the iMD application and gave the participating patient a tablet computer on which to use the iMD application in a semiprivate waiting area or examination room. Research staff were available to provide technical assistance on the use of the program when needed. The iMD had 3 key components: (1) assessments, (2) tailored videos, and (3) a bilingual summary printout. The assessments on the tablet had audio options with read-aloud text and allowed patient users to respond interactively by using a touch screen. The videos delivered in-language messages tailored to a patient's individual responses to the assessment questions, which were captured and driven by branching logic within the iMD program. There were 28 video segments in total; the durations for the videos ranged from 8 to 65 seconds, averaging 29 seconds in length. Patients watched 14 to 22 video segments depending on their responses. At the end of the iMD session, the program printed a 1-page bilingual summary for the participant to share and discuss with his PCP during the visit immediately following the iMD session. Below, we provide a walk-through description of the iMD intervention. The application started with an introductory video of a doctor introducing the iMD program and providing instructions on using the tablet. Guided by the 5As of the guidelines,14 Ask involved the smoking behavior assessments. Advise was delivered by a video with the doctor advising the patient to quit smoking, with a motivational enhancement message focusing on personal and family health. The video was followed by Assess, which involved the doctor asking the patient to use the touch screen to indicate his plan for quitting. Assist was tailored to the patient's readiness (“not thinking about quitting” vs “thinking about quitting or wanting to quit now or soon”). For example, for a patient who indicated “not thinking about quitting,” he was asked to indicate the reasons for not thinking about quitting, and tailored videos addressing the selected reason(s) were then played. For patients who were “thinking about quitting,” they were asked to indicate concern(s) related to quitting and were shown videos tailored to their concerns. The tailored videos discussed topics on various health effects from smoking (cancers, lung diseases, cardiovascular diseases, and second- and third-hand smoke), concerns related to stress and social pressures of smoking, and evidence-based resources for quitting (quitline and Food and Drug Administration-approved medications). The selection and contents of key video topics were based on patient and provider feedback during the intervention development phase. Arrange was delivered in a video, tailored to the user's readiness for quitting, which aimed to encourage the patient to follow-up with his PCP by discussing their tobacco use with a summary printout to be generated by the program. After the last video, a screen showed up asking the patient to inform the research staff that the program was finished. The research staff then selected the print or e-mail option on the program and obtained 2 identical copies of the summary printouts, 1 for the patient, and 1 for the patient's PCP. Research staff gave the printout to either the clinical staff or the PCP to be included in the patient's medical record. The summary printout aimed to provide actionable information to the PCP on the patient's current smoking status, readiness to quit, concerns about quitting, along with a list of recommendations (such as tailored cessation advice, referral to quitline, and descriptions of appropriate nicotine replacement therapies). A sample summary printout in bilingual English-Vietnamese is shown in Figure 1. 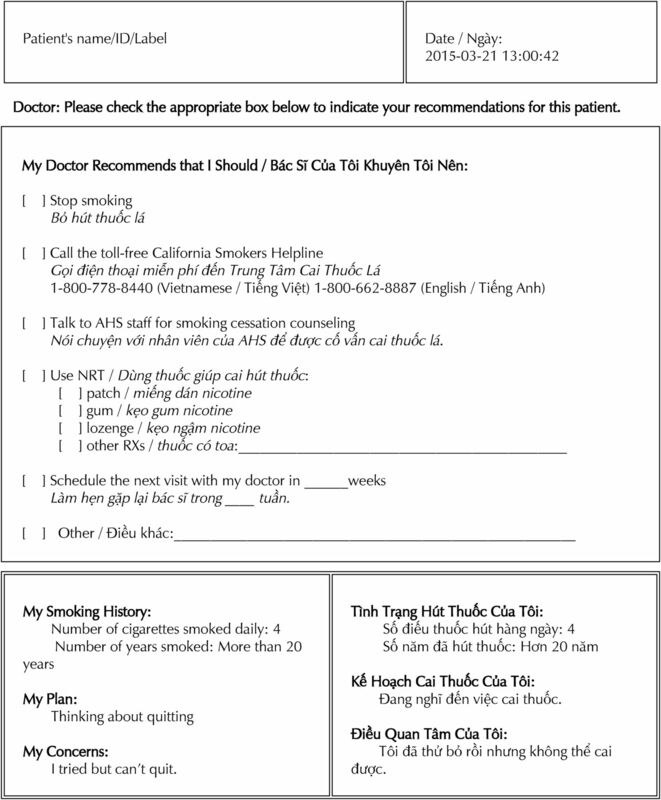 Sample bilingual summary (English/Vietnamese) printout generated by the Interactive Mobile Doctor (iMD) intervention. Data sources included (1) participant self-report via in-person or telephone survey assessments at baseline, postvisit, and 3-month follow-up with each taking 2 to 5 minutes to complete; (2) the EHR system; (3) iMD's programmed smoking behavior assessments; and 4) the research staff's observations of participant behaviors during iMD use. Most assessment items have been used in population-based surveys in tobacco use with Korean and Vietnamese Americans.11,19⇓–21 New items assessing the acceptability of iMD were developed for the study to obtain feedback on video length, understandability, and perceived helpfulness of the intervention in deciding to quit smoking and in communicating with PCPs, which were reviewed by patient advisors during the intervention development phase. From EHR, age, marital status, years lived in the United States, and income as a percentage of the federal poverty level were obtained. Tobacco-related illnesses (hypertension, diabetes, chronic obstructive pulmonary disease, cardiovascular diseases, stroke, asthma, acute bronchitis, or cancer) and behavioral health conditions (depression, anxiety disorders, sleep disorders, and alcohol abuse) were extracted from International Classification of Diseases, Ninth Revision codes documented in the EHR. Participants' education attainment and self-rated health were obtained from the baseline survey. From the baseline survey, participants indicated whether and by which method(s) they had attempted to quit smoking in the past 12 months. From iMD's digitized assessment, participants provided data on cigarettes smoked per day, years of regular use, time to first cigarette22 (within 5 minutes after waking, 6 to 30 minutes, 31 to 59 minutes, 60 minutes or longer after waking), intention to quit smoking in the next 6 months, and any 24-hour quit attempts in the past year. From research staff observations during iMD administration, feasibility data obtained were intervention duration (computed from start and end times), percentage of participants who needed technical assistance during program use, the kind of assistance needed, and percentage of participants who completed the entire iMD session before seeing their PCP. Intervention acceptability measures were obtained from the postvisit survey, which included satisfaction ratings on length of the iMD program (“too long,” “just right,” or “too short”), ease in understanding the video messages (from 1 = “too difficult to understand” to 4 = “quite easy to understand”), helpfulness in the decision to quit, and helpfulness in enhancing communication with the PCP (from 1 = “not at all helpful” to 4 = “very helpful”). At the 3-month follow-up survey, participant self-reported smoking abstinence (time since participant last smoked), any 24-hour quit attempts, and quit methods attempted since the iMD session were assessed. From the postvisit survey, participants were asked to report whether tobacco use discussions with their PCPs occurred during that visit (yes vs no) and to rate their satisfaction of patient-provider discussion on tobacco use (from 1 = ”not at all satisfied” to 4 = “very satisfied”). From the EHR, PCP progress notes were extracted from 3 consecutive PCP visits of each participant: (1) 1 PCP visit before the iMD visit (preintervention); (2) at the intervention visit; and (3) 1 visit after (postintervention). Textual data were coded independently by 2 authors (TBD and JYT) using code definitions adapted from prior research,23 and discrepancies were resolved via team discussions. The coding captured the absence or presence of each of the 5As at each progress note abstracted. Table 1 shows coding definitions and sample quotes. SPSS version 24.0 was used. Descriptive statistics, frequencies, percentages, means, and standard deviations were used to describe the study sample, feasibility and acceptability outcomes, and smoking cessation-related outcomes. To estimate the impact of iMD on the EHR-documented 5As, we conducted a separate multivariable logistic regression for each of the 5 binary outcomes (Ask, Advise, Assess, Assist, and Arrange) with a logit link. The generalized estimating equation (GEE) was used to account for PCP clusters and to estimate time effect by comparing each 5A outcome at the iMD visit and the postintervention visit with preintervention visit as the referent. Correlates that attained P values < .05 in bivariate analyses in 1 of the 5A outcomes were included as covariates in the multivariable regression analyses. Age (recoded to <60 years of age vs 60+), education (below high school vs high school or beyond), and cigarettes smoked per day (<10 vs 10+) were included as a priori covariates. Statistical significance was assessed at the .05 level (2-sided). A list of 133 potential patients was identified from EHR. Ultimately, 47 participants enrolled and 42 participants completed a 3-month follow-up, yielding participation and retention rates of 87.0% and 89%, respectively. Figure 2 shows the participant flowchart. Participant flow diagram. PCP, primary care provider. Table 2 shows the baseline characteristics of the 47 male participants who were between 28 and 71 years old (mean age, 56.4 years; SD, 9.9), including 68.1% that had at least 1 tobacco-related illness and 36.2% that had 1 or more diagnosed behavioral health conditions. A majority (72.4%) smoked 10 or fewer cigarettes daily. At baseline, 53.2% indicated no plans to quit smoking in the next 6 months. Among those (n = 28) who attempted quitting in the past year, 25% used prescribed medications or over the counter nicotine replacement therapy (NRT) and 11% reported advice or counseling received from their health care provider but none reported the free quitline services available in Korean and Vietnamese languages (data not shown). Table 3 shows the feasibility and acceptability outcomes. A majority (75%) of participants completed iMD within 13 minutes and ranged from 10 to 25 minutes. All but 2 (95.7%) completed the entire iMD session before seeing their providers. One third (36%) needed assistance, but most of the help was needed for answering the first couple of assessment questions when participants were unsure of how to advance or to clear the number entered on the keypad. At postvisit, a majority thought the length of the video program was “just right,” and the messages were easy to understand. Most found that iMD was “moderately” or “very” helpful both in deciding to quit and in enhancing the quality of communication with their PCP. At 3 months, 78.7% reported having tried to quit smoking at least once; however, 51.1% (of all 47 participants) were able to quit for at least 24 hours since the iMD intervention visit. Of note, among 11 participants who reported having never tried to quit smoking at baseline, 7 reported making their first quit attempt lasting at least 24 hours since the iMD session. Participants reported using various quitting resources: gradual reduction (73.0%), family support (40.5%), “cold turkey” (29.7%), provider advice (27.0%), medication (over the counter NRT or prescribed medicine, 27.0%), and e-cigarettes (13.5%). One participant (2.7%) reported using the quitline. Of the participants (n = 5) who reported using e-cigarettes to quit smoking, none achieved abstinence. Using intention-to-treat analysis, with missing data assumed to be nonabstinent, 19.1% of (n = 9) participants reported 7-day smoking abstinence and 10.6% (n = 5) reported 30-day point prevalence abstinence at 3 months. At the postvisit interview, 100% of patients reported discussing tobacco use with their PCP. Almost all (97.9%) were “somewhat” to “very” satisfied with the discussion with their PCP at their visit. A total of 141 EHR progress notes were abstracted from 3 consecutive PCP visits of all 47 patients. A majority (85%) of the participants saw the same PCP for 2 of the 3 visits, which provided progress note data. A total of 10 PCPs were involved in providing care for 1 to 10 participating patients in the study. Figure 3 shows the percent of progress notes documenting each of the 5As in the selected PCP visits. As part of Assist, 29.8% of the patients were prescribed or received recommendation for medications (NRT or bupropion) at the intervention visit compared with 4.3% and 0% at the visit before and after the intervention visit, respectively. 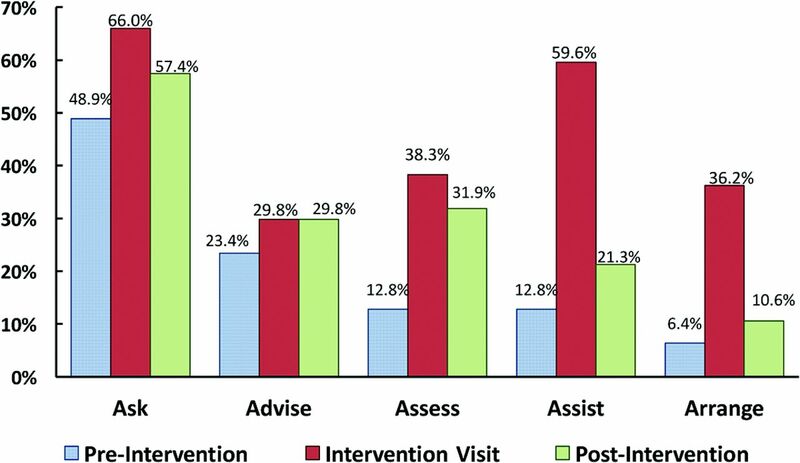 Referrals to quitline or counseling services were noted for 19.1% of the patients at the intervention visit, in contrast to 2.1% and 0% at pre- and postintervention visits, respectively. Documented primary care providers' delivery of the 5As (Ask, Advise, Assess, Assist, and Arrange) to 47 study participants across 3 consecutive primary care visits at preintervention, intervention, and postintervention based on 141 progress notes extracted from electronic health records. Table 4 depicts the GEE results accounting for PCP clusters and including ethnicity, age, education, tobacco-related diseases, and cigarettes smoked per day as covariates. The intervention visit progress notes had significantly higher documentations for Assist and Arrange than both the pre- and postintervention visits (P < .01). Documentation of Assess was similar between intervention and postintervention visits, both of which were significantly higher than the preintervention visit. Ask and Advise, however, were similar across all 3 visits. A multilingual iMD intervention delivering 5As through tailored video messages on a mobile tablet while the patients were waiting to see a provider was feasible and acceptable among Korean- and Vietnamese-speaking male smokers in a FQHC setting. In addition, this intervention was highly acceptable among smokers in the study sample, as over half of the participants had no intent to quit smoking within the next 6 months. A large impact of EHR-documented 5As delivery, particularly on Assess, Assist, and Arrange, was observed at the iMD intervention visit when compared with the visit before or the visit following. Findings at 3-months postintervention showed promising self-reported quit attempts (51%) and an encouraging 7-day point prevalent smoking abstinent rate (19%). Although there have been ample clinical trials that promote smoking cessation or providers delivering 5As in clinic settings,24 this is the first study to our knowledge that specifically targeted non-English speaking Asian American smokers in primary care. Despite the encouraging results observed in EHR-documented 5As delivery in association with the iMD intervention, the impacts of iMD seem to be limited to the visit when patient received iMD before the clinical encounter. Among the increased documentations of the 3As (Assess, Assist, and Arrange) observed from preintervention to intervention, the increase in Assess was the only A that was maintained at postintervention. The failure of maintaining the treatment effect on Assist and Arrange is not fully understood from the study data. The literature to date has provided limited understanding of the factors affecting the delivery of Assist and Arrange. One study found that patients with cardiovascular conditions were more likely to report receipt of Assist and Arrange by patients' self-report.26 Another study based on EHR-documented 5As reported that older age was associated with Assist documentation; however, no meaningful analysis could be further conducted on Arrange delivery due to so few Arrange documented (2% out of 1200 progress notes reviewed).23 Both age and comorbid health conditions were adjusted in our multivariable analyses (Table 4). 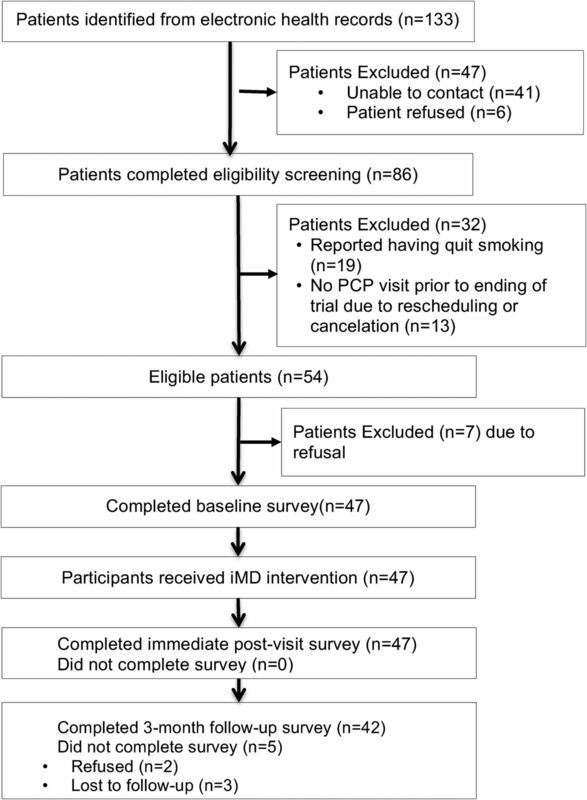 In a separate study that involved reviewing EHR progress notes of 106 smoking participants, including the 47 participants in this study sample and additional patients enrolled in another smoking trial at preintervention, we found that patients who were assessed as unmotivated to quit were less likely to have Assist documented.30 One plausible explanation for the decreased documentation of Assist and Arrange from intervention to postintervention could be that many more of the patients were unmotivated to quit smoking at postintervention without the iMD intervention. We reviewed the EHR progress note contents related to patients' readiness for quitting and found that more patients were assessed as “not ready, precontemplative, or not motivated” at the visits without the iMD intervention: 67% at pre- and 78% at postintervention visits without iMD, and 39% at the intervention visit with iMD administered. Similarly, for Arrange, we observed that 88% of those patients that had Arrange documented at the intervention visit also had Assist documented. Thus, the decrease from intervention to postintervention in Arrange could be due to a large decrease in Assist, and fewer patients were reported as ready for quitting at the postintervention visit. A prior randomized control trial found that a repeated administration of a Video Doctor intervention delivering tailored video messages plus provider cueing at 2 consecutive visits in prenatal settings significantly increased the odds of patients reporting assistance received at both encounters.31 Thus, to achieve the recommendations of delivering 5As at every clinical encounter, it will likely require repeated administration of the iMD or interventions targeting both patients for motivation enhancement and providers for reminders to facilitate 5A delivery at each encounter. To address tobacco use, health information technology-based interventions are being tested in primary care settings. For example, a pilot study testing “FAST-Feedback” that provided guideline-based feedback to both patients and providers on a range self-reported health behaviors showed increased discussions on mental health but no difference in smoking-related discussions.24 In addition, a text-based computer-facilitated 5A intervention is being tested among English- and Spanish-speaking primary care patients.32 A unique feature of the iMD intervention is that it uses tailored and interactive videos with education contents delivered in languages (Korean and Vietnamese) and images tailored to the Asian culture. Our preliminary findings showed that more than 90% of Korean- and Vietnamese-speaking patients indicated the iMD messages were easy or not difficult to understand and were helpful in their decision to quit smoking and communication with their PCP. This is a pilot feasibility study and has several limitations. This study used a single-group pre-post intervention design, without a control condition. The efficacy of the iMD intervention remains to be further tested in randomized controlled trials. Most of the outcomes, including patient-provider discussion of tobacco use and smoking cessation outcomes, were assessed by patient self-report, which might be subject to recall or other biases. EHR notes were the source for providers' delivery of 5As during the clinical encounter. These notes are subject to individual writing styles and time factors and may present selection bias in reporting. In addition, PCPs were aware of the study implementation, and by receiving the summary printout, they were reminded that their patients were enrolled in the study and, thus, the EHR-documented 5A outcomes could be biased. Nonetheless, the EHR data enabled longitudinal observational comparisons on EHR-documentation of the 5As by PCPs in visit notes at visits before, with, and after the iMD intervention. The small sample size of this pilot also resulted in some wide 95% confidence intervals. Nonetheless, the use of the GEE models enabled comparisons of the observed data across time, with PCP clusters and other covariates accounted for in the models. The odds ratio estimates should be considered with caution. The results supported the difference in the EHR-documented 5As between the intervention visit and other visits for the same patients and most with the same providers. Lastly, the study was conducted among Korean and Vietnamese smoking patients in a FQHC setting, which is not generalizable to other Asian or primary care patients in other primary care settings. The iMD intervention within a clinic setting is feasible and acceptable to Korean and Vietnamese smoking patients, including those who were unmotivated to quit smoking. This intervention is promising to increase patient-provider discussions of tobacco use among Asian American immigrants. Future studies should examine and identify strategies to address health care system and cultural challenges that may impact the uptake of iMD if this intervention is found efficacious. The preliminary findings warrant a larger scale of randomized controlled trials to test the efficacy of the iMD intervention. Based on these findings, our research team is currently conducting a randomized controlled trial with the iMD intervention expanded to include English, Cantonese (Chinese), Korean, and Vietnamese, with a 6-month follow-up and biochemical verification using salivary cotinine for smoking abstinence (ClinicalTrials.gov identifier, NCT02966132). The authors would like to express their gratitude to the AHS Korean and Vietnamese patient advisory councils for serving as the study's patient advisors, and the AHS patients who participated in focus group interviews, usability testing sessions or the pilot study, as well as AHS clinical staff and providers for their support during study implementation. We would like to acknowledge Ky Vo who performed software development of the iMD mobile application; Hy Lam for filming and video editing; Drs. Mychi Nguyen, Suzy Lim, Ricky Choi, and Arthur Chen for intervention development; Isabel Nguyen for commenting on the initial draft of the manuscript; and the following individuals for their assistance in patient recruitment, translation and data collection: Jinyoung Chun, Terrence Park, Susan Yoon, and Jen Lee. Lastly, we would like to thank the University of California San Francisco Vietnamese Community Health Promotion Project's Community Advisory Board for providing feedback at each phase of the project. Funding: This study was supported by the California Tobacco-Related Disease Research Program Community Academic Research Award grants: 21BT-0056H, 24AT-1300H, and 24AT-1301H. To see this article online, please go to: http://jabfm.org/content/31/6/869.full. Received for publication January 17, 2018. Revision received June 12, 2018.
. The Asian population: 2010. In: U.S. Department of Commerce EaSA, editor. 2010 Census Briefs. Washington, DC: U.S. Census Bureau; 2012. California Health Interview Survey. 2011–12 CHIS Adult Survey (AskCHIS). Los Angeles CA: UCLA Center for Health Policy Research; 2013.
. Smoking among Asian Americans: acculturation and gender in the context of tobacco control policies in New York City. Health Promot Pract 2013;14:18S–28S.
. Asian American, Native Hawaiian and Pacific Islander tobacco use patterns. Am J Health Behav 2014;38:362–9. California Health Interview Survey. CHIS Adult Survey (AskCHIS) [online interactive database]. Los Angeles CA: UCLA Center for Health Policy Research; 2016.
. The social context of smoking cessation in China: an exploratory interview study. Tob Control 2012;21:57–8.
. Culture and smoking among Vietnamese Americans in central Massachusetts. J Transcult Nurs 2012;23:151–8.
. Factors associated with smoking in Asian American adults: a systematic review. Nicotine Tob Res 2008;10:791–801.
. Pulmonary function, chronic respiratory symptoms, and health-related quality of life among adults in the United States—National Health and Nutrition Examination Survey 2007–2010. BMC Public Health 2013;13:854.
. Chinese and Vietnamese adult male smokers' perspectives regarding facilitators of tobacco cessation behavior. Asian Pac J Cancer Prev 2007;8:429–35.
. Individual and family factors associated with intention to quit among male Vietnamese American smokers: implications for intervention development. Addict Behav 2011;36:294–301.
. A national Asian-language smokers' quitline—United States, 2012–2014. Prev Chronic Dis 2015;12:E99.
. A social network family-focused intervention to promote smoking cessation in Chinese and Vietnamese American male smokers: a feasibility study. Nicotine Tob Res 2015;17:1029–38.
. Treating tobacco use and dependence: 2008 update. Clinical practice guideline. Rockville, MD: U.S. Department of Health and Human Services. Public Health Service; 2008.
. A comparison of cessation counseling received by current smokers at US dentist and physician offices during 2010–2011. Am J Public Health 2014;104:e67–75.
. Discussions between health care providers and their patients who smoke cigarettes. Hyattsville, MD: National Center for Health Statistics; 2014.
. Identifying themes for effective smoking cessation messaging to Vietnamese and Korean immigrant patients. Poster presented at the 2014 Society for Research on Nicotine and Tobacco 20th annual meeting, Seattle, WA; 2014, February.
. California Korean American Tobacco Use Survey—2004. Sacramento CA: California Department of Health Services; 2005.
. Smoking prevalence and factors associated with smoking status among Vietnamese in California. Nicotine Tob Res 2010;12:613–21.
. Time to first cigarette in the morning as an index of ability to quit smoking: implications for nicotine dependence. Nicotine Tob Res 2007;9:S555–70.
. Documentation of the 5 As for smoking cessation by PCPs across distinct health systems. Am J Manag Care 2014;20:e35–42.
. A randomized controlled pilot trial of the functional assessment screening tablet to engage patients at the point of care. J Gen Intern Med 2014;29:1641–9.
. Effectiveness of the 5-As tobacco cessation treatments in nine HMOs. J Gen Intern Med 2009;24:149–54.
. Disparities in receipt of 5As for smoking cessation in diverse primary care and HIV clinics. Prev Med Rep 2017;6:80–7.
. Primary care provider-delivered smoking cessation interventions and smoking cessation among participants in the National Lung Screening Trial. JAMA Intern Med 2015;175:1509–16.
. Provider smoking cessation advice among California Asian-American smokers. Am J Health Promot 2011;25:S70–4.
. Ask-Advise-Connect: a new approach to smoking treatment delivery in health care settings. JAMA Intern Med 2013;173:458–64.
. Documentation of assistance provided by primary care providers to support smoking cessation among Asian American patients. Ann Behav Med 2018;52:S376.
. Promoting smoking cessation in pregnancy with Video Doctor plus provider cueing: a randomized trial. Acta Obstet Gynecol Scand 2010;89:515–23.
. Beyond the Ask and Advise: implementation of a computer tablet intervention to enhance provider adherence to the 5As for smoking cessation. J Subst Abuse Treat 2016;60:91–100.